(17/P102) TRENTON – The Department of Environmental Protection, working with numerous partners, has been recognized for outreach efforts that are helping coastal municipalities understand and implement innovative strategies to become more resilient to storms and flooding, Commissioner Bob Martin announced today. This effort, recognized by the New Jersey Chapter of the American Planning Association, includes community workshops, DEP outreach to municipal officials, technical assistance to local governments, and grants to help municipalities assess areas vulnerable to storms and flooding. The American Planning Association’s New Jersey Chapter honored the DEP with an Excellence Award for Community Engagement/Education for advancing public and community understanding of storm resiliency. The DEP’s Office of Coastal and Land Use Planning, along with its partners, implemented the project using a $3.4 million grant provided in 2014 by the U.S. Department of the Interior and administered by the National Fish and Wildlife Foundation as part of the Hurricane Sandy Coastal Resiliency Competitive Grant Program. More than 30 municipalities conducted vulnerability assessments as a result of the program. A key component of the DEP’s outreach effort is the development of Building Ecological Solutions to Coastal Community Hazards: A Guide for New Jersey Coastal Communities. This user-friendly guidebook, developed with the National Wildlife Federation and numerous other partners, outlines ecological approaches that can be implemented at the municipal level in every type of coastal community, ranging from encouraging planting of native dune grasses and creating living shorelines to assessing and restoring salt marshes. “The DEP developed the guide to show coastal municipalities the advantages of using green strategies to make their communities more resilient to storms and flooding, efforts that at the same time benefit wildlife and the natural environment,” said DEP Assistant Commissioner for Land Use Regulation Ginger Kopkash. The Monmouth County Park System has for years worked to build an extensive natural dune system at Seven Presidents Park in Long Branch that has naturally grown and is densely vegetated with native plant species complemented by aggressive removal of non-native species. The area is utilized by piping plovers, an endangered beach-nesting bird. 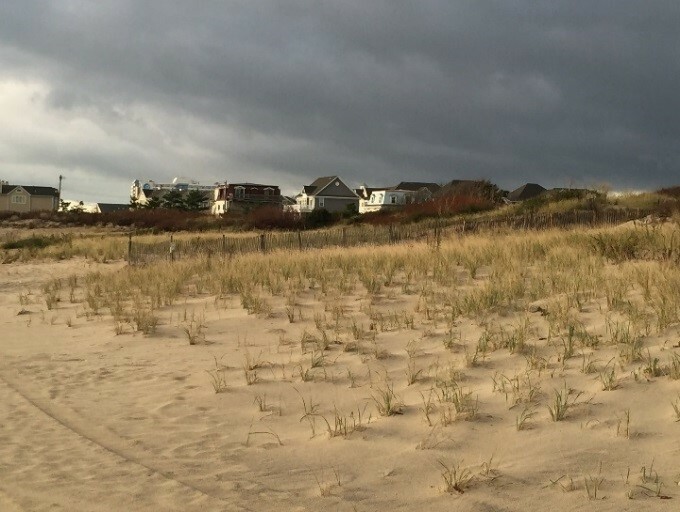 In South Seaside Park, Ocean County, a dune system built of sand fencing and dune grass following a devastating 1992 nor’easter grew so large naturally that it protected the area from Superstorm Sandy 20 years later. In Cape May County, Stone Harbor Point and the Stone Harbor Bird Sanctuary, established by local ordinances, showcase outstanding examples of coastal shrub and maritime forest vegetation in mature dunes, areas that provide excellent bird habitats. In addition, clustered development set back from the shoreline is buffered by landscapes planted with native vegetation, with trails providing opportunities to enjoy nature. The guide provides detailed examples of the benefits of assessing and nurturing the natural ecosystems that are integral to coastal areas – beaches, dunes, coastal forests, shrub lands and salt marshes. 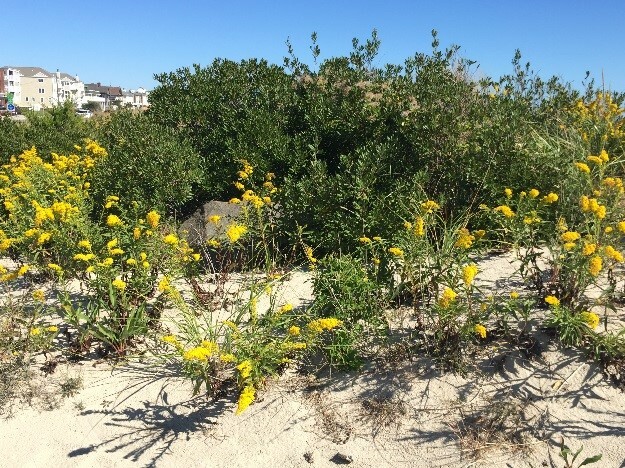 While New Jersey has lost much of its coastal forests to development during the height of coastal development decades ago, re-establishing them can hold dunes in place, protecting property and infrastructure while providing habitat for songbirds and other wildlife. Good examples of coastal forests can be found in Belmar, Stone Harbor, Avalon, Cape May City, and Cape May Point. Coastal forests and shrub lands behind barrier islands and along bays and creeks serve as windbreaks, provide erosion protection and reduce peak flood height, thereby protecting property and infrastructure such as roads, the manual notes. The guide suggests ways to maximize the benefits of these ecosystem types by connecting them through preservation and restoration with planting of native plant species. Conserve, restore and protect native dune vegetation, including paying close attention to gaps between vegetated areas. Establish ordinances and practices that support establishment, growth and succession of dune vegetation to provide shrub and forest cover. Incentivize and promote landscaping with maritime forest and shrub vegetation where ecologically appropriate through ordinances, education and outreach. Conduct inventories of native trees and shrubs; map patches of shrub and forest. Avoid creating or re-engineering existing hard infrastructure that can contribute to erosion and interfere with natural processes. Develop a seed bank of native plant species for native landscaping and habitat restoration. Design and build public demonstration natural-vegetation gardens and landscaping exhibits with interpretive signs. Encourage restoration of natural systems such as living shorelines – beach areas planted with natural vegetation and shellfish – as an alternative to bulkheads in strategic areas. Designate conservation zones to allow for marsh migration through zoning, development setbacks, conservation easements, and targeted buyouts. Work with state and federal officials to develop plans to restore degraded tidal marshes, including areas that have been altered through past construction of ditches or dikes. Collaborate with scientists from local universities and nonprofit organizations to assess the health of tidal marshes, including assessments of water flows, bank stability, and presence of wildlife such as fiddler crabs, diamondback terrapins, and marsh birds. In addition to the National Fish and Wildlife Foundation and National Wildlife Federation, DEP technical partners in the effort include Sustainable Jersey, the Partnership for the Delaware Estuary, New Jersey Sea Grant Consortium/the Stevens Institute of Technology, the Barnegat Bay Partnership, New Jersey Audubon Society, and Rutgers University’s Edward J. Bloustein School of Planning and Public Policy. Local government partners include Atlantic City, Brigantine, Downe Township, Lower Township, Margate, Secaucus, Somers Point, Spring Lake, Upper Township, and Cape May County.